The 2019 Community Summer Fete will be in August - the date is yet to be confirmed. 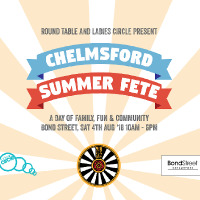 The annual Community Summer Fete in the Bond Street is co-hosted by Chelmsford Ladies Circle and Chelmsford Round Table. We took over the Bond Street Bowl to host a Summer Fete for everyone in the Heart of Chelmsford. Activity stalls manned by local charities provided classic fete favourite games. The stage saw local bands, comedy sketches and family entertainment. A BBQ and licenced bar kept everyone refreshed. The event was a success and we hope to hold it every year.